Laura and Juan’s wedding day was wonderful in so many ways! It was an absolutely perfect summer day and everything seemed to fall into place with ease. 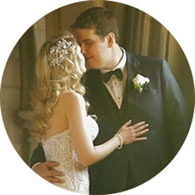 There were so many touching moments and happenings throughout the day as you’ll see in their wedding film – it was a pleasure being their wedding videographer, capturing it all for their wedding video. The couple’s ceremony and reception were both held at a wedding venue we had never filmed at before, but have wanted to for quite some time. Hacienda Sarria is located about an hour west of Toronto in the city of Kitchener. This elegant venue evokes feelings of sunny southern Europe with it’s exquisite old world Spanish style architecture and detailing. One thing is certain, our wedding videography at Sarria resulted in some of the most unique and stunning wedding visuals we’ve ever filmed. The quality and feel of the saturated, golden light both outside and inside the building is clearly evident from the opening shot of Laura and Juan’s wedding highlights film to the last. Our video cameras absolutely loved it. Speaking of which, and without further delay, please enjoy Laura and Juan’s gorgeous wedding highlights film! © 2019 Summerfield Films Wedding Videographers Toronto|ProPhoto Photography Website|BY THE DESIGN SPACE Co.